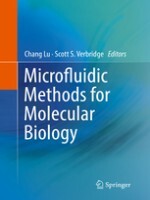 This book covers the state-of-the-art research on molecular biology assays and molecular techniques enabled or enhanced by microfluidic platforms. Topics covered include microfluidic methods for cellular separations and single cell studies, droplet-based approaches to study protein expression and forensics, and microfluidic in situ hybridization for RNA analysis. Key molecular biology studies using model organisms are reviewed in detail. This is an ideal book for students and researchers in the microfluidics and molecular biology fields as well as engineers working in the biotechnology industry. Reviews exhaustively the latest techniques for single-cell genetic, epigenetic, metabolomic, and proteomic analysis. Illustrates microfluidic approaches for inverse metabolic engineering, as well as analysis of circulating exosomes. Broadens readers’ understanding of microfluidics convection-based PCR technology, microfluidic RNA-seq, and microfluidics for robust mobile diagnostics.